What happens when the world’s largest space agency gets hit by simultaneous arbitrary budget cuts and accusations of security lapses? It starts pulling up the drawbridges, that’s what. On March 13, NASA Administrator Charles Bolden issued a new policy on NASA personnel travelling to conferences: they can’t. In response to sequestration cuts that went into effect March 1, NASA decided that all personnel would be forbidden to attend any conference in the non-continental United States and would have to justify their attendance at any other conference, including “substantial participation” in the conference, which description does not apply to attendance or moderating a panel. On March 16, the FBI arrested Bo Jiang on suspicion of removing sensitive information from his job as an aviation safety researcher at the NASA Langley Research Center and attempting to take it back to China. The arrest followed a public campaign by US Congressman Frank Wolf to implicate Chinese nationals working at NASA facilities in charges of espionage. Wolf’s accusations include NASA interns attempting to report their summer’s work back to their home universities overseas as well as Jiang, against whom the only evidence of espionage appears to be attempting to return to China just before his visa expired and carrying with him a second laptop, a hard drive, and a SIM card. In the aftermath, NASA launched an investigation into all 200+ foreign nationals working at its facilities and eliminated public access to NASA documents. On March 22, Bolden issued a memorandum cancelling all outreach and education activities as another sequestration measure. Inspiring and training the next generation is largely seen as one of NASA’s key functions – as well as a mechanism to generate public support and thereby increase funding. The outcry against the late-Friday decree nearly drowned out outrage at the conference ban. The NASA technical reports server will be unavailable for public access while the agency conducts a review of the site’s content to ensure that it does not contain technical information that is subject to U.S. export control laws and regulations and that the appropriate reviews were performed. The site will return to service when the review is complete. This is a disappointing and unexpected turn of events in the very year that reform to the onerous International Trafficking in Arms Regulation (ITAR) was finally issued, promising some relief to engineers and scientists trying to collaborate across borders to advance and improve space utilization. The NTRS database is widely used both inside and outside the United States as a valuable resource in all space-related fields of endeavor. “There is a HUGE amount of material on NTRS,” space policy analyst Dwayne Day told the Federation of American Scientists’ Secrecy News. “If NASA is forced to review it all, it will never go back online.” Given the timing, it can only be hoped that any graduate students planning to deliver dissertations referencing NTRS documents had the foresight to download copies. In addition to NTRS, it appears a database of Mercury/Gemini/Apollo documents at NASA Fort Worth have also been withdrawn. What technical value 30-60 year old historical records might have at this point doesn’t seem to have factored into the decision-making in this instance. The approach is sure to chill relations between collaborating agencies and laboratories, with NASA employees and contractors pulling in their heads for fear of being the next one to be fingered for security violations. In no other field, excepting perhaps studies of avian flu variants, is scientific endeavor subjected to such constraints. The outcome is likely to be reduced collaboration, an increase in preventable mistakes and accidents, increased duplication of research, and a slower global rate of advancement. If ever there was a time for NASA and its legislative controllers to admit they can’t go it alone, now would be that time. 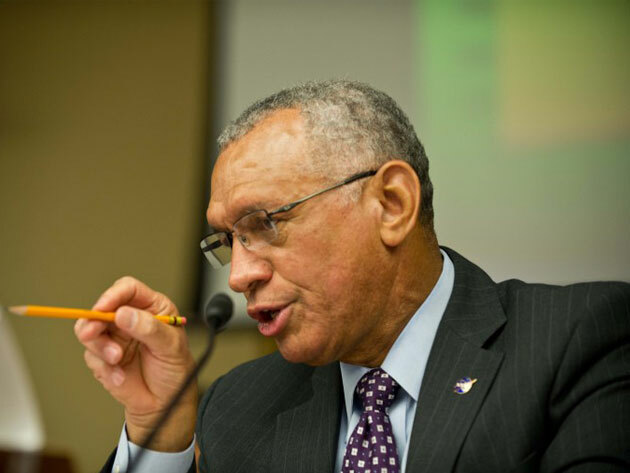 NASA Administrator Charles Bolden tells Congress what’s what at a March 19 hearing on asteroid preparedness (Credits: AFP). NASA’s leadership position in world space endeavours has already been under attack in recent years due to its floundering strategic plan, lack of human spaceflight capability, shrinking budget, and string of mission cancellations. While other space agencies are becoming more collaborative to deal with economic constraints, NASA is becoming only more insular. Between sequestration, a steady tattoo of ‘regular’ budget cuts, and nationalistic witch hunts, it is hard to see how the US space agency can hold onto the mantle of pioneering space exploration’s future for very much longer. Opinions expressed are those of the author and do not necessarily reflect the positions of Space Safety Magazine, the International Space Safety Foundation, or the International Association for the Advancement of Space Safety. NASA is prohibited from China with good reason. The wisdom of a policy that treats China as an enemy is a question on which I could discourse for sometime, but that is not the question here. The accusations in this case are based on the flimsiest of circumstances, in which any foreign student interning or performing research could easily find themselves. Just because a student is Chinese is not a reason to trump up charges of espionage, nor is it at all likely to improve Chinese space capabilities – or relations for that matter. We need to apply a smidgen of commonsense to these cases. This blockage is ridiculous. These publications are already cleared and should not be subject to retroactive review. Furthermore NASA has prevented the Internet Archive (archive.org) from mirroring this resource. You can bet “inimical parties” have already mirrored these documents, so if one were to leap to any conspiracy theories, the removal favors them over the taxpayer. That’s because the effect here is to remove a taxpayer funded resource from lowest cost public access. Frankly, if NASA can’t assure reliable access of this resource (NTRS) it should be made available for public providers not under NASA oversight. J.M., I completely agree with you!